Our latte hammock chairs add an elegant and sophisticated look to any outdoor patio or garden space. Each hammock chair featured in our GardenFun collection adds a sleek, modern design that sets the stage for comfort. Select from a large variety of designs that have something to suit everyone's needs, including bicycles, sandpiper birds, dragonflies, mums and more. Sit in a comfortable swing that sways back and forth in a gentle breeze. 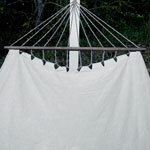 Each chair hammock can hang from a patio, tree branch, swing set and is ideal for any home or garden design. Read a book wrapped up in a blanket and enjoy the sunset in front of a cozy bonfire as the nighttime air comes in. 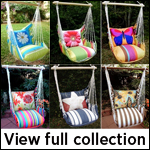 Anyone seeking a more traditional hammock will enjoy lounging in our great designs that are charming and created with durability in mind.